Newborn Diapers Archives « Breastfeed.Babywear.ClothDiaper.Naturally! Breastfeed.Babywear.ClothDiaper.Naturally! When it comes to cloth diapers we’ve tried them all. That includes different styles, brands, price points, and more. I recall buying a package of flats before our first was born about five years ago. I heard they were intimidating and… they were! Actually, it wasn’t the flats that were intimidating so much as the flats on top of, you know, that whole being a new parent and all the new things and choices that come with parenting. Flats were just one more thing to learn. I ended up selling that ½ dozen of flats but made another purchase about two years in at the encouragement of some other cloth diaper mamas. “So easy,” they said. They were right. I love them! They make up about a third of our stash now, mostly because I don’t want to invest in more when we are mostly through our diapering years. So why should you give them a try? Flats wash easy. Being only one layer thick your detergent does not have to make its way so deep into many layers of an insert to get the muck out. This is especially helpful if your needing to diaper a toddler with ammonia strong urine. Flats don’t tend to hold smell like some synthetic materials or thick inserts do. Flats fold easy. Sure you can do the fancy but really you just bring corner to corner until the right size for babe. You can tailor the basic fold to add absorbency in the front or between the legs or at the bum depending on if you have a boy or a girl, belly sleeper or back layer. Because they can fold quite trim, adding a second one does not add a lot of bulk, especially when folded to wrap around the babe as a fitted. Flats are cost-effective. You can find very inexpensive flats options in the kitchen section of many stores. Most all flats are (bleached or unbleached) natural fibers. They can vary by weave. Ultimately most are cotton, sometimes with a blend of hemp or bamboo for additional absorbency. These tend to be more expensive but still cost-effective when compared to inserts of similar makeup. If you are really on a budget, are the supreme of eco-friendliness, or are in a pinch you can use many things as a “flat,” including t-shirts and dish towels. Flats last. There is rarely need to buy multiple sizes. You can fold small for newborns or turn long ways and still fit on a toddler. This is one reason they are so cost-effective. Flats shine in specific circumstances. Washer on the fritz? Prefer to hand wash? Going camping? Traveling? Flats win. In many situations flats are a great go-to for all the other reasons listed combined. Flats are many things to a diaper. You can fold them more intricately. You can pad fold them simply. They can go into a cover or into a pocket. You can use them as more of a fitted. Whatever you need a flat can be that. Flats have other uses. Flats make great burp cloths. They also are fantastic cleaning cloths for around the house once babe no longer needs them. Again, this makes for a cost-effective, eco-friendly choice in cloth diapering! If you absolutely know you’ll have a smaller child (planning a delivery earlier rather than later, for example) you might want to invest more in newborn cloth. Many more established brands have newborn-specific diapers. Some go down to four pounds. If you are like my extended family where no baby was ever born smaller than 8 pounds then investing in extra small cloth may look a little different. Consider 2-size systems like Apple Cheeks, Blueberry, Bummis, and Thirsties that offer a 7ish to 18ish pound size range. You’ll get the more trim fit of a newborn diaper but with the longevity up to 18 pounds. If the cloth diaper lingo is overwhelming, join a cloth diaper group that can aid and support you in your many questions along the way. They may even become online friends in those early morning hours while you are up, yet again, bleary-eyed and feeling alone. If you are really nervous about all the possibilities consider something simple like an all-in-one diaper or prefolds with covers. Pocket diapers are fairly simple as well with only stuffing required. If you’re very comfortable and open then the possibilities are endless. I began with mostly pockets but now have a variety and love flats just as much now. Consider parents, grandparents, daycare, and anyone else who will change your babe’s diaper. If already ambivalent then Velcro/aplix diaper closures might work best. Snaps have a minor learning curve for the willing but may be intimidating for those less excited about cloth. Also, while trying a wide variety of diapers can help you find what you like best, sticking with one or two specific diapers (same brand, same style) can help. Within each style (all-in-one, pocket, covers, etc.) every brand tweaks the diaper in small ways. Snaps may be placed slightly differently, the cut of each brands diaper may vary from one to the next, and so on. This can be confusing to someone unfamiliar or less interested in cloth diapering. If you begin from day one with cloth you may need to address meconium, the umbilical cord, or circumcision. Meconium, your baby’s first stool passings, is dark and sticky and tarlike. If you’re concerned with staining you can use a liner. I have not found it to be an issue. For the umbilical cord some brands offer a snap down or cut the diaper to give space for the umbilical cord. I’ve found that some diapers can simply be tucked under in order to give way for the umbilical cord. If you can only wash every 3 days you’ll need to have more diapers than if you’re willing to wash every 1-2 days. If you want the diapers to last through multiple children you may need a larger stash (though newborn diapers are used for a shorter period of time so they may last several children even if used daily). A newborn goes through 8-12 diapers per day, so 16-24 diapers for two days, and 24-36 diapers for three days’ worth of washing. Flats or prefolds and covers are generally the biggest bang for your buck. They also wash very easily and can grow with baby. A newborn prefold can become a toddler doubler down the road. You can also use them as burp cloths or wash/cleaning rags one day down the road. A YouTube search can offer you many demonstrations on a variety of fancy folds (origami is our favorite) but almost anyone can master a simple pad fold. Consider used cloth diapers if you really want diapers you can’t afford. Often people sell nearly new diapers for deeply discounted prices on B/S/T (buy/sell/trade) Facebook groups. You can also vary the size of your stash to accommodate your preferences and budget. If you really want the more expensive diaper brand then buy fewer of them and wash more often. Cloth diapering a newborn can be a bit intimidating. Today the cloth diaper options are so diverse and can give you anything from cute and stylish to plain and practical. Styles run from fashionable to simplistic, as do price ranges. Some of the options available to parents are whether to use pocket diapers, All-in-ones, or prefolds. Pocket diapers are just that–the waterproof shell is lined with fleece or flannel and has a pocket for the liner pad. The diaper can be stuffed with microfiber, bamboo, hemp or flannel pads. 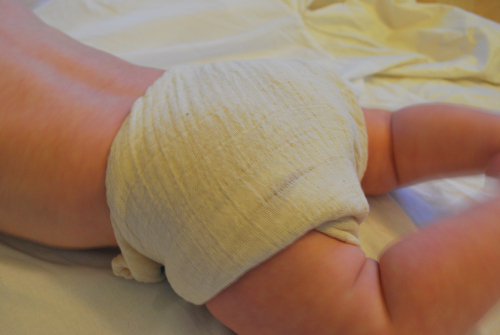 All-in-one diapers are similar to pockets but the liner pad does not come out. Prefolds are large cotton diapers that can be folded to fit the baby. You can use these with a Snappi or pins to help keep the diaper snug. These are not waterproof and need to be worn with a diaper cover–either a waterproof PUL cover, fleece or wool. There are also fitted diapers that fit the baby snugly and are used with a cover. Another option is choosing Velcro or snaps on our diapers. Oh the choices! The biggest thing to keep in mind when cloth diapering a newborn is to mind the umbilical stump and to make sure the fit is snug. Newborns tend to blow out diapers and wet small amounts quickly, which sometimes can leak in diapers that do not fit right. A simple trick is to put a tissue in the diaper to help see if they have wet. To help protect the umbilical stump, many newborn diapers come with an extra fold down snap to help leave the area uncovered. Cloth diapers need to be washed about every two days, so with newborns going through 10 to 12 changes a day, you will need 24 to 36 diapers at first. A diaper pail, pail liner and cloth-diaper friendly detergent will also be needed. I find using cloth wipes is a natural step in cloth diapering a baby–if you’re already washing diapers, why not just add the wipes too? 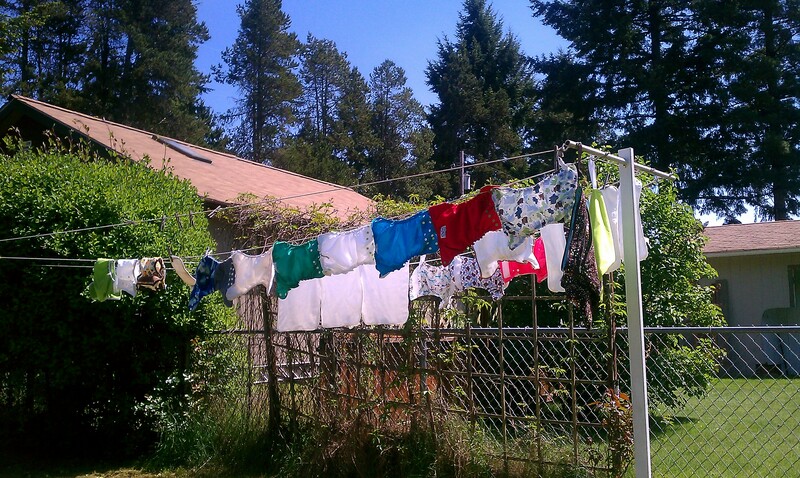 Cloth diapering is both frugal and addictive! 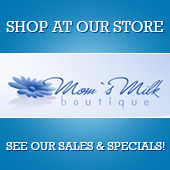 The styles and fashions, plus seeing the cute fluffy cloth bums is a fun way to show your style in your baby’s diapers. Pia Watzig is a cloth diapering enthusiast and lover of all things fluffy butts. She lives in Portland Oregon and has three sons aged 5, 2 and 2 months. I’m not exactly sure at what point in my pregnancy I became interested in cloth diapering, but I do know that for the first few weeks of researching options, the terms and lingo were so confusing! “Prefold” was especially troublesome. Was it something I had to pre-fold before using? How did one fold it, whatever it was? Cloth diapers practically come with their own language, and it can take some time before you become fluent. So here’s a list of the most common terms you will encounter as you begin to look into cloth. These are the type of diaper you put on your baby, based on construction and appearance. AIO – All-In-One – This diaper is the closest to a disposable, since the absorbent material is sewn into the diaper. Some may have the option to add absorbency, some may not, but the basic idea is that everything you need is already sewn into the waterproof shell. AI2 – All-in-two - The same concept as an All-In-One, except that the absorbent material tends to snap into place inside the waterproof shell. Hybrid – A waterproof shell plus either reusable or disposable absorbent material. Pocket - A diaper with a waterproof outer shell and a lined interior that creates a pocket for holding absorbent material. Most, but not all, come with inserts (see definition below). Probably the most common form of modern cloth diaper on the market. Fitted - A cloth diaper that is not waterproof. This has the shape of a modern cloth diaper and is made entirely of absorbent material. This diaper requires the use of a waterproof cover and is often used as a night time diaper option. Prefold - One of the “old fashioned” versions of cloth diapers and what your mother or grandmother will likely think of when you begin to talk about cloth. A flat rectangle of fabric, typically cotton, that has multiple absorbent layers sewn into the middle. This diaper has to be folded and fastened onto baby and requires the use of a waterproof cover. Prefolds are economical and are generally considered among the easiest options to launder. Flat - A flat also falls into the “old fashioned” category. Flats are large, single layers of cotton that must be folded and fastened onto baby and require the use of a waterproof cover. They are also economical and extremely easy to launder. Cover - A waterproof shell designed to go over absorbent material. Covers have no absorbency and must be paired with a prefold, fitted, or other appropriate insert. Insert - Absorbent material typically designed to be tucked inside of pocket diapers. Can be man-made fiber or natural. Pocket diapers (purchased new) typically come with an insert suited to the diaper, but inserts can be purchased separately for added absorbency or due to preferring a particular fiber. Snappi - The modern alternative to diaper pins. These are a stretchy, Y-shaped piece of plastic with grabby “teeth” that are used to fasten prefolds, flats, and closure-less fitteds. Boingo - Like a Snappi, they are an alternative to diapers pins, but are two pieces rather than one. Liner - A liner is something that is placed between baby and the diaper. Some are disposable (some flushable) and are used to catch poop for easy disposable. Some are fleece and are typically used to keep babies skin dry. PUL - Polyurethane Laminate – This is a waterproof material used to make covers and the outer shell of pocket diapers and All-In-Ones. TPU - Thermoplastic Urethane – Another waterproof material. WAHM - Work At Home Mom – This term is used to describe diapers that are made in a home based business. OS - One Size – Diapers typically are either sized, meaning you will buy different sizes as baby grows, or “one size”, meaning that the diaper typically fits a child within a range of 8-35 lbs and grows with baby from birth on. There are many, many other terms that you will come across as you really dive into the depths of cloth diapers, but as you come to speak the language they all become much easier to understand. Hopefully this helped welcome you into the world of cloth! Kate Cunha lives in the Pacific NW with her husband and daughter. She’s a huge cloth diaper advocate and just a bit sad that her daughter is currently saying goodbye to their cute fluff. Sweet little babes come in a variety of perfect sizes. Many parents prepare for their newborn wondering what will fit in those very first days. The hubs and I came from families with big babies. While pregnant I was measuring on the larger side, too. I am no medical professional, and you never know what exactly is in that belly, but we figured our babes would show up…sturdy. Our first was 9 pounds, 8 ounces; our second tipped the scale at an even 10 pounds. Most everything we received or purchased didn’t hinge on the size of the babe. There were a few products that we would have purchased differently looking back now. These are great options for ALL size newborns, but especially for those on the sturdy side! Muslin Wraps: I registered for a variety of receiving blankets for reasons unclear to me. Perhaps it was a combination of the cute prints, soft fabric, or registry suggestions in the store. They were too small for swaddling my large newborn effectively. Eventually, I cut and serged the edges into 8”x 8” wipes and hankies for use around the house. I received a pack of Aden + Anais as an unexpected gift. 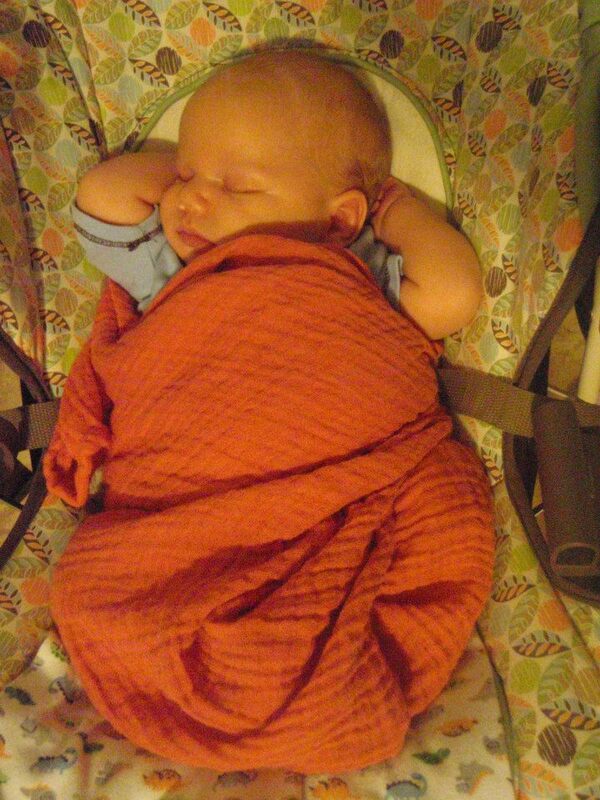 The large size allowed me to swaddle my babes effectively and continue through to toddlerhood in use. The light fabric was perfect for layering any time of year, even in Texas. 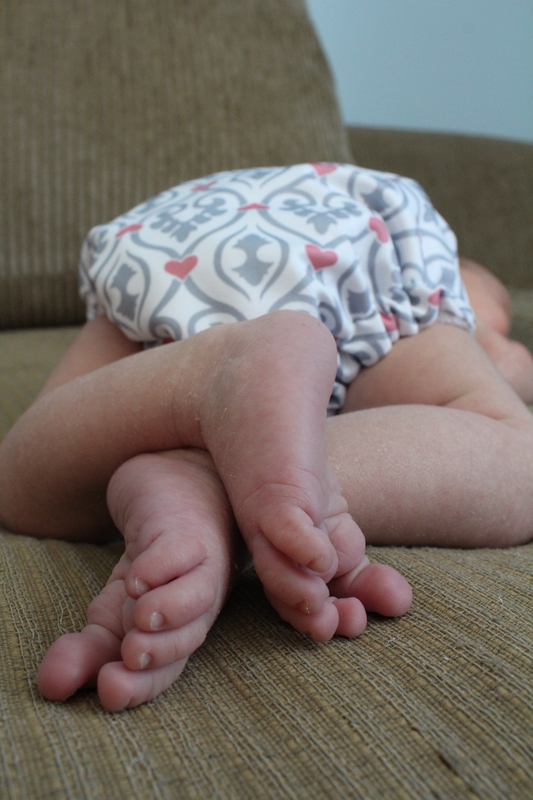 Cloth Diapers: Newborn diapers were almost entirely useless to us, as most only fit up to 12 pounds. We used them for several weeks at most before they became snug. Instead of newborn diapers, I’d suggest purchasing some of the multi-size options. We loved Fuzzibunz Perfect Size Small, as well as the size systems that Applecheeks, Thristies, and Bummis offer. Their Small/Size 1 systems fit up to 16-20 pounds depending on the brand. This offered months of use. We also had plenty of OS that our babes fit in quite quickly, though they were bulky. Having some of those sized diapers gave us trim options in the early months. By the time babe outgrew them, we needed fewer diapers each day anyway and didn’t have to really purchase more of a larger size. Our mix with OS was enough. Boppy: I’ll admit our Boppy may have worn down in stature from pure use of it, but I wonder if having the heavier lad did not help to flatten our Boppy out more quickly. I didn’t realize just how much we’d used the Boppy until we purchased a second one and suddenly I nursed without my upper back aching! Having a second one of these is convenient and will distribute the wear and tear if you plan on using it long term. If this is your second babe, consider purchasing a new pillow to allow for the best support. We used ours for the first 9-10 months of life while and nursing full time.